In 1984 Örjan Wikander published a brief but important landmark study which overturned the commonly-accepted idea that although the ancient world knew the water-mill, it was not until the early middle ages that its use became common (Wikander 1984). He showed that the large number of references to early medieval water-mills in surviving documents is a function of the nature of our sources. Much surviving Greco-Roman literature is epic, didactic or elegiac poetry, narrative history, tragedy or philosophy, none of which is likely to spend much time discussing water-mills. The bulk of the references we do have come from scientific, technical or encyclopaedic writings, which are comparatively rare. The massive increase in the rate of references to water-mills in written documents of the fourth and fifth centuries AD coincides with the introduction of new genres of writing – legal codes, hagiography, and monastic charters, all of which are much more likely to refer to such relatively mundane devices. By contrast, the bulk of the archaeological material known in 1984 came from the second and third centuries AD, when no literary sources refer to water-mills at all – a reflection of the relatively small number of texts that have survived from this period. Two conclusions follow from the different pictures presented by the documentary and archaeological sources. First, the documentary sources cannot by themselves provide a guide to the relative frequency over time of the use of water-power. Secondly, the large number of documentary references to water-mills in the early middle ages, a time when the archaeological record is sparse, indicate that the archaeologically identified record must represent only a very small fraction of the original total. 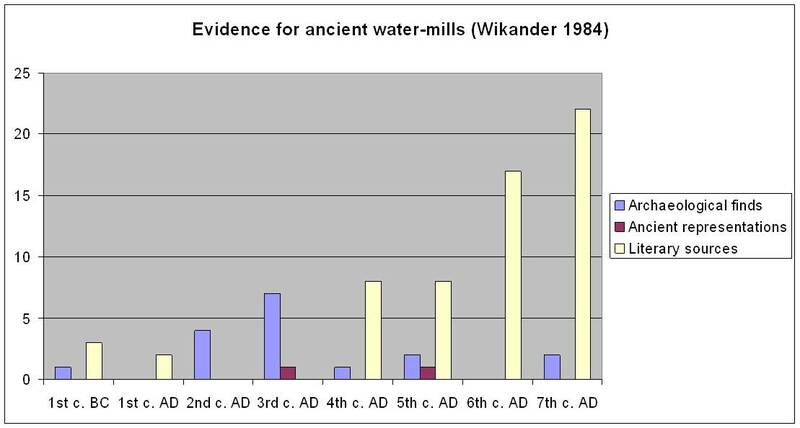 In the 22 years since Wikander’s publication, our knowledge of ancient water-mills has increased dramatically, not least due to the efforts of Wikander himself (Wikander 1985; 2000; Lewis 1997; Brun and Borréani 1998; Wilson 2002). Sources: Wikander 1980; Wikander 1985; Wikander 2000; present study. Some earlier written evidence dating back to the third century BC has now been identified (Lewis 1997), but while otherwise the number of known literary sources and iconographic representations remains similar, the numerous archaeological discoveries have changed the picture. The number of archaeologically known sites has increased threefold. 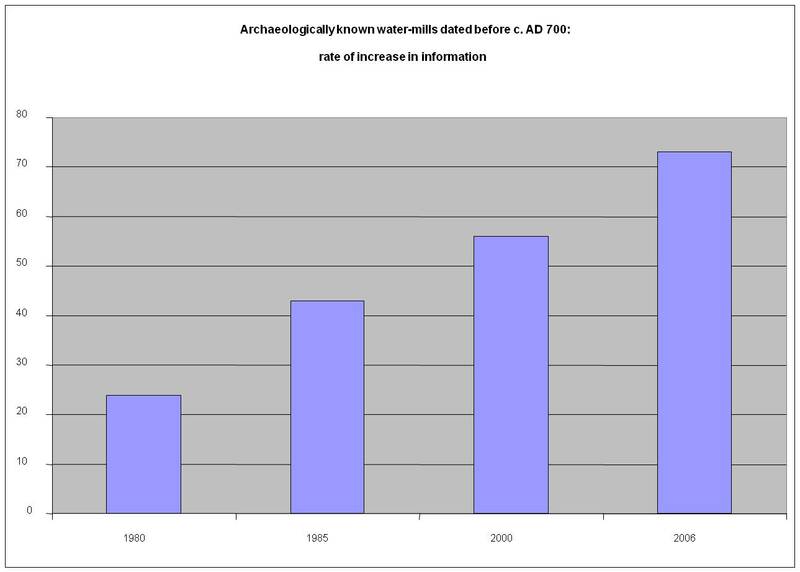 The second- and third-century AD peak is now much more pronounced, with appreciable numbers of water-mills now apparent also in the first and fourth centuries AD. The slight rise in the seventh century is principally due to a number of discoveries of wooden tidal mills in Ireland. The archaeological evidence offers the best potential for assessing the comparative use of water-power over time, as it is the category least affected by biases in the evidence. 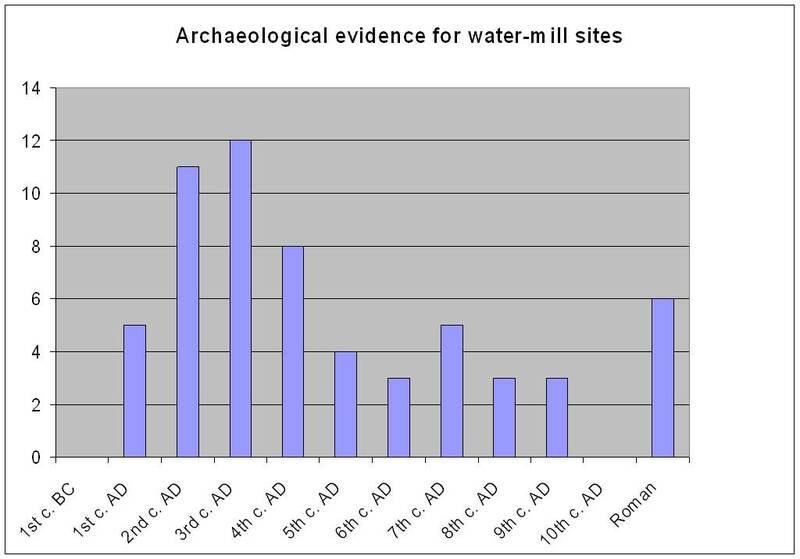 But an analysis on the basis of archaeological data makes the assumption that archaeological evidence for water-mills is equally likely to survive from any period, an assumption which requires some scrutiny. On the one hand, water-mills are vulnerable to erosion by changing water-courses, which stacks the odds more heavily against older sites. In other words, the survival of Roman sites may carry a greater relative value than the survival of medieval sites. The materials in which a mill was constructed may have a bearing on survival or identification rates, and initially one might wonder if the Roman propensity to build in stone might lead to a correspondingly greater identification of Roman sites over wooden early medieval ones. However, a large number of known Roman water-mills in northern Europe are also made of wood, and in any case, mills may also be identified on the basis of finds of mill-stones. On balance, it seems that the Roman material is not overrepresented in the archaeological record, and the peak in the Roman period is real. Indeed, it is actually more pronounced than the graph at first sight suggests, as the six sites in the right-hand column, dated no more closely than the ‘Roman’ period, need to be distributed across the columns for the first–fourth centuries AD. If evenly distributed, they would further accentuate the Roman-period peak, but all the more so for the second and third centuries if they were distributed in proportion to the pattern already suggested by the graph, in a near-normal distribution. 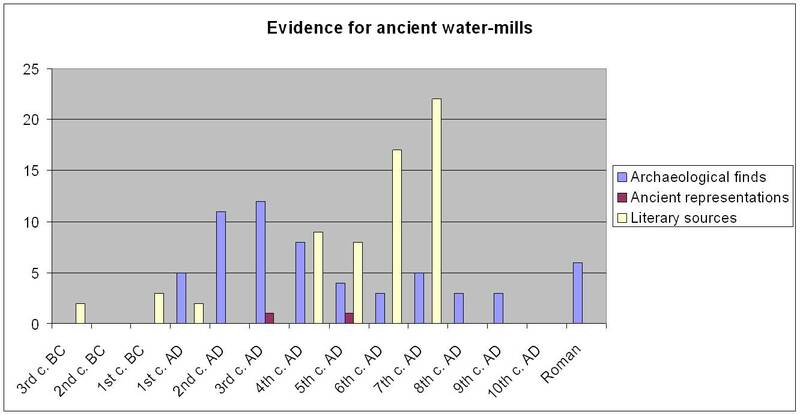 The much greater number per century of Roman water-mills than early medieval ones appears to indicate a more intense and widespread usage of the technology in the Roman period (first to fourth centuries AD) by comparison with the early medieval period (fifth to ninth centuries AD). This is an important claim to make; it suggests that the Roman uptake of mechanical technology for productive ends was considerable already during the first century AD, and its use in the second and third centuries could, in part, reflect patterns of per capita growth. The drop in numbers after the third century appears broadly consistent with other indices (building inscriptions, salting vat capacities) analysed by the project. Source data compiled from: Amouric et al. 2000; Barker et al . 1999; Brun and Borréani 1998; Castella 1994; Czysz 1994; Johannowksy 1994; Oleson 1984; Roos 1992; Saarisalo 1927, 79 f.; Trovò 1996; Wikander 1985; Wilson 1995; 2002. The full dataset will be made available online towards the end of the OXREP project. Amouric, H., Thernot, R., Vacca-Goutouli, M. and Bruneton, H. (2000) Un moulin à turbine de la fin de l'Antiquité, - La Calade du Castellet (Fontvieille). In P. Leveau and J.-P. Saquet (eds) Milieu et sociétés dans la vallée des Baux. Études présentées au colloque de Mouriès. Revue Archéologique de la Narbonnaise, supplément 31: 261-73. Montpellier, Éditions de l'Association de la Revue Archéologique de Narbonnaise. Barker, G. W., Adams, R., Creighton, O. H., Gilbertson, D. D., Grattan, J. P., Hunt, C. O., Mattingly, D. J., McLaren, S. J., Mohamed, H. A., Newson, P., Reynolds, T. E. G. and Thomas, D. C. (1999) Environment and Land Use in the Wadi Faynan, Southern Jordan: the Third Season of Geoarchaeology and Landscape Archaeology (1998). Levant 31: 255-92. Brun, J.-P. and Borréani, M. (1998) "Deux moulins hydrauliques du Haut Empire romain en Narbonnaise. Villae des Mesclans à La Crau et de Saint-Pierre/Les Laurons aux Arcs (Var)," Gallia 55: 279-326. Castella, D. (1994) (ed.) Le moulin hydraulique gallo-romain d'Avenche *en Chaplix . Aventicium 6. Lausanne. Czysz, W. (1994) Eine bajuwarische Wassermühle im Paartal bei Dasing. Antike Welt. Zeitschrift für Archäologie und Kulturgeschichte 25: 152-4. Lewis, M. J. T. (1997) Millstone and hammer: the origins of water power. Hull. Johannowsky, W. (1994) Canali e fiumi per il trasporto del grano. In Le ravitaillement en blé de Rome: 159-63,Abb. Naples, D'Auria (diffusion). Oleson, J. P. (1984) A Roman water-mill on the Crocodilion river near Caesarea. Zeitschrift des Deutschen Palästina-Vereins 100: 137-52. Roos, P. (1992) A water-mill at the Lamas River. In IX. Arastirma Sonuçlari Toplantisi. 27-31 Mayis 1991, Çanakkale: 1-8. Ankara, T. C. Kültür Bakanligi. Saarisalo, A. (1927) The boundary between Issachar and Naphtali. An archaeological and literary study of Israel's settlement in Canaan. Helsinki. Trovò, R. (1996) Canalizzazioni lignee e ruota idraulica di età romana ad Oderzo (Treviso). Quaderni di archeologia del Veneto 12: 119-34. Wikander, Ö. (1980) Vattenmöllor och möllare i det romerska riket. Lund. Wikander, Ö. (1984) Exploitation of water-power or technological stagnation? A reappraisal of the productive forces in the Roman Empire, Studier utgivna av Kungl. Humanistiska Vetenskapssamfundet i Lund, 1983-1984, 3 (Lund). Wikander, Ö. (1985) "Archaeological evidence for early water-mills - an interim report," History of Technology 10: 151-79. Wikander, Ö. (2000) "The water-mill," in Ö. Wikander (ed. ), Handbook of Ancient Water Technology, Technology and Change in History 2. Leiden, 371-400. Wilson, A. I. (1995) Water-power in North Africa and the development of the horizontal water-wheel. Journal of Roman Archaeology 8: 499-510. Wilson, A. I. (2002) "Machines, power and the ancient economy," Journal of Roman Studies 92: 1-32.